The "Design Information" table in Output 101.8.1 displays design specifications and the derived statistics. With the specified alternative reference, the maximum information is derived. The "Method Information" table in Output 101.8.2 displays the and errors, alternative reference, and derived drift parameter, which is the standardized alternative reference at the final stage. With the STOPPROB option, the "Expected Cumulative Stopping Probabilities" table in Output 101.8.3 displays the expected stopping stage and cumulative stopping probability to reject the null hypothesis at each stage under various hypothetical references , where is the alternative reference and are values specified in the CREF= option. With the PSS option, the "Power and Expected Sample Sizes" table in Output 101.8.4 displays powers and expected sample sizes under various hypothetical references , where is the alternative reference and are the default values in the CREF= option. With the PLOTS=ASN option, the procedure displays a plot of expected sample sizes under various hypothetical references, as shown in Output 101.8.5. By default, expected sample sizes under the hypotheses , , are displayed, where is the alternative reference. With the PLOTS=POWER option, the procedure displays a plot of the power curves under various hypothetical references for all designs simultaneously, as shown in Output 101.8.6. By default, the option CREF= and powers under hypothetical references are displayed, where are values specified in the CREF= option. These CREF= values are displayed on the horizontal axis. Under the null hypothesis, , the power is 0.025, the upper Type I error probability. Under the alternative hypothesis, , the power is 0.9, one minus the Type II error probability. The plot shows only minor difference between the two designs. The "Boundary Information" table in Output 101.8.7 displays information level, alternative reference, and boundary values. By default (or equivalently if you specify BOUNDARYSCALE=STDZ), the alternative reference and boundary values are displayed with the standardized Z scale. That is, the resulting standardized alternative reference at stage k is given by , where is the specified alternative reference and is the information level at stage k, . 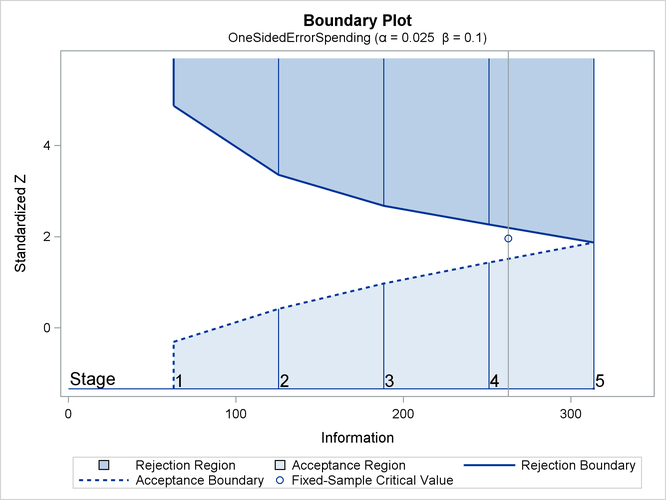 With ODS Graphics enabled, a detailed boundary plot with the rejection and acceptance regions is displayed, as shown in Output 101.8.8. This plot displays the boundary values in the "Boundary Information" table in Output 101.8.7. The "Error Spending Information" table in Output 101.8.9 displays cumulative error spending at each stage for each boundary. 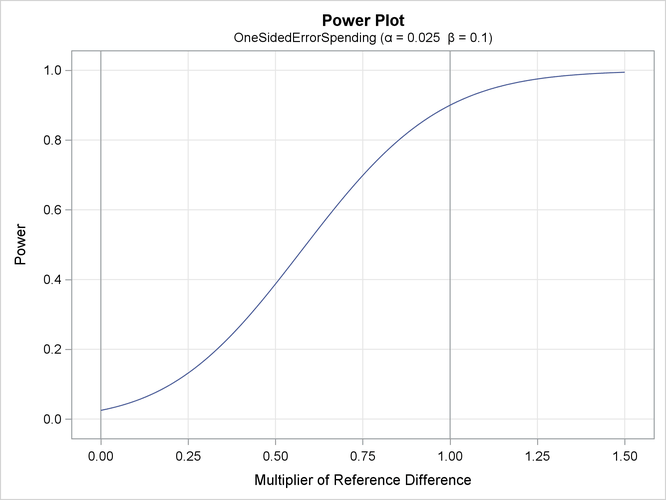 With the PLOTS=ERRSPEND option, the procedure displays a plot of error spending for each boundary, as shown in Output 101.8.10. 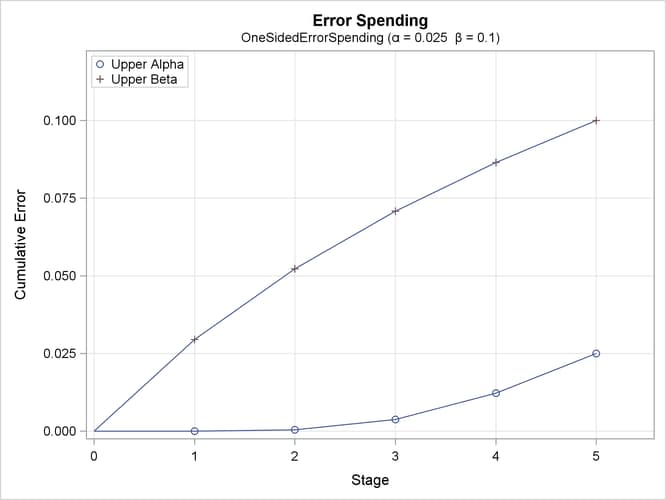 This plot displays the cumulative error spending at each stage in the "Error Spending Information" table in Output 101.8.9. 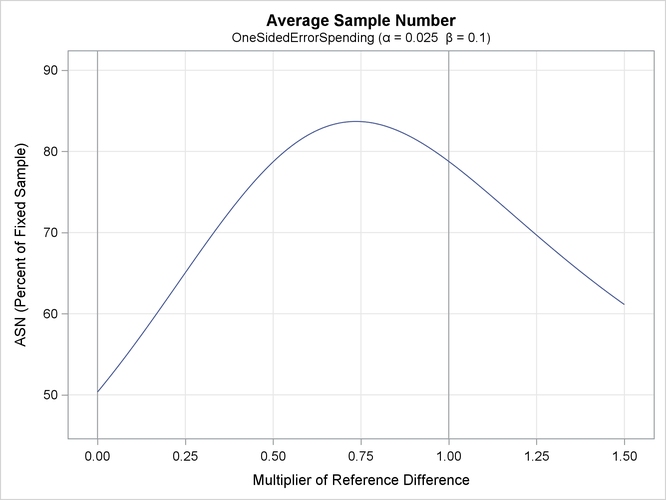 The O’Brien-Fleming-type spending function is conservative in early stages because it uses much less at early stages than in the later stages. In contrast, the Pocock-type spending function uses more at early stages than in the later stages.